What It’s About: United Planet cruiser C57D, commanded by J. J. Adams (Leslie Nielsen), arrives on the planet Altair IV to check on the farm colony ship Bellerophon, which disappeared twenty years earlier. Linguist Dr. Edward Morbius (Walter Pidgeon) contacts the C57D and warns the ship to stay away as he cannot protect Adams and his crew from whatever killed the rest of the Bellerophon colony. Adams ignores the warning and the C57D lands. Morbius sends his robot assistant Robby to bring a small party to his home, which features technology far beyond known science. Morbius lives with his beautiful daughter Alta (Anne Francis). When Adams ignores Morbius’s second warning and plans to contact Earth, the C57D begins receiving nightly visits from an invisible creature. After it destroys the ships communication equipment, it moves on to attacking the men themselves. Can Adams figure out what the creature is, what happened to the earlier expedition, and what Morbius is hiding before it’s too late? Why Watch it Today? : Star Trek premiered today in 1966. Forbidden Planet is the direct antecedent to Star Trek, with its “United Planets” paramilitary explorers who touch down on a planet and confront a mystery, lead by a head strong commander assisted by a science officer and an older doctor. 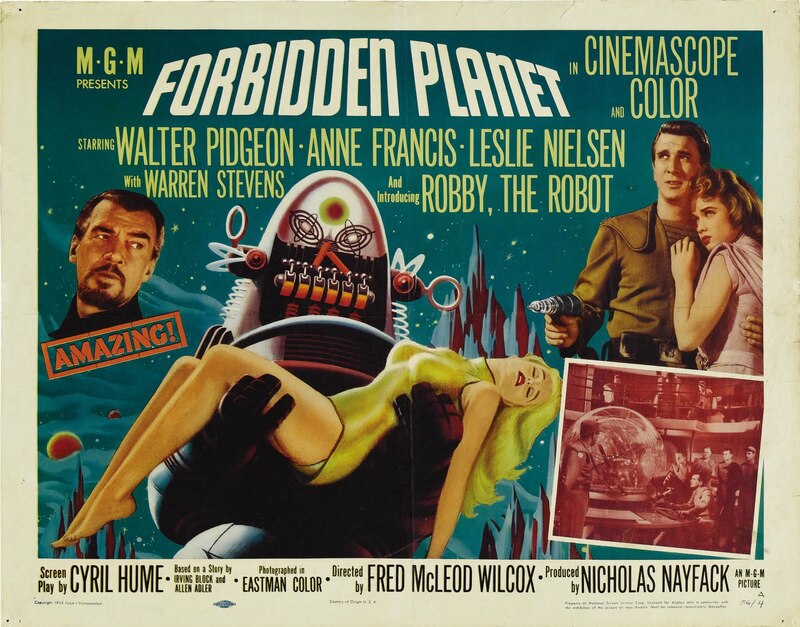 While the basic set-up is now quite familiar and the effects (and gender politics) are dated, Forbidden Planet is one of the touchstones of science fiction and a must see for every fan. Other Choices: Star Trek II: The Wrath of Khan is easily the best Star Trek movie ever made; or you could watch legendary misfire Star Trek: the Motion Picture. This entry was posted in Adaptation, Animation, Based on a Play, Movie of the Day, Mystery, Robots, Sci-Fi, Space Travel, The Original and tagged Anne Francis, Best Effects-Best Special Effects Nominee, comedic robot, dated gender roles, Earl Holliman, Jack Kelly, James Best, Les Tremayne, Leslie Nieslen, Marvin Miller, MGM, overbearing father, Richard Anderson, Robby the Robot, Robert Dix, robot servant, scientists, space exploration, Walter Pidegon, William Shakespeare. Your timing is uncanny again – TCM played this yesterday or the day before! Looks like they played it the 6th. One of these days we’ll show them on the same day. A very notable thing you did not mention, is the all electronic sound tranck by Craig and Bebe Barron. No film before or since, has done such a thig. The movie was almost completed when the filmakers discoverd the Barrons in their electronics filled apartment in Greenich village New York. A trailor for the film features western type orchestral music. The electronic soundtrack doubles the unique quality of this movie. It’s a great soundtrack. One of the weaknesses of my Movie of the day series is that we are just trying to briefly hit the high points of the movie and tie it into the day. This of course means we often leave out some things-thanks for adding to the post with you comment-it really is a fantastic, and unique score. I also failed to mention the wonderful animation effects and, hell, even Robby the Robot! 2 more things, we never actually meet the Krell. It is left to our imagination. No depiction of them could be as effective a filmaking device as not ever seeing them. At the opening of the movie, we see a flying saucer in space. Not a saucer full of aliens as usual, but a saucer FROM Earth. I always thought that was very cool. Robby was the coolest robot ever created in movies. He kind of had the personality of a slightly sarcastic butler from a fifties film. This is my favorite film of all time.I got to actually meet Robby at his first public appearance in 50 years, at a Motion Picture Academy of Arts And Science event in San Rafael 6 months ago. A whole theatre of adults became 10 years old when Robby walked down the aisle. A peak moment in my life.